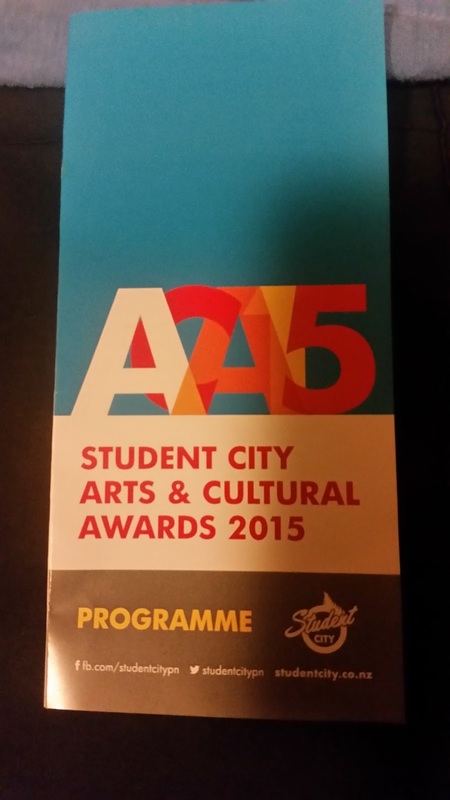 Each year the Palmerston North holds the Student City Cultural and Arts awards. These awards are presented to students of Palmerston North for the contributions to the community in specific areas of arts and culture. This year there were eight catagories with seven judges. 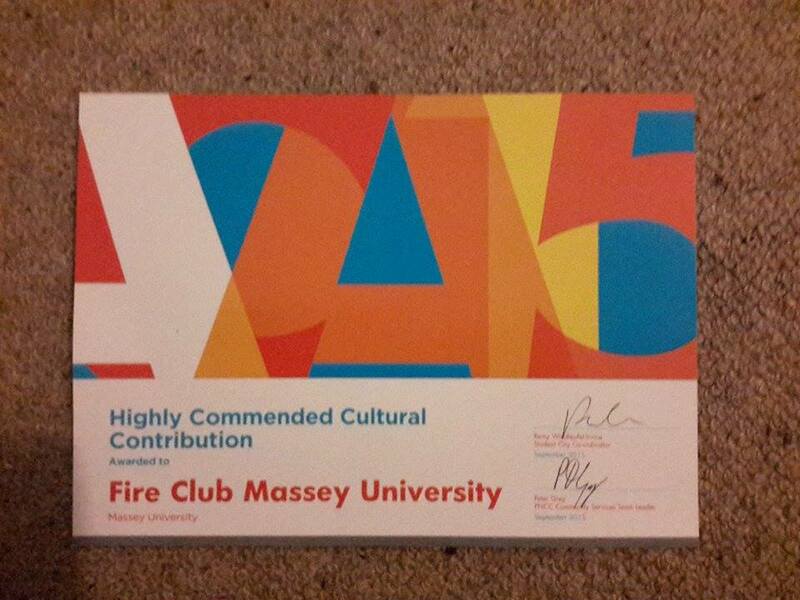 The Fire Club was nominated for best performing artist, and best cultural contribution. 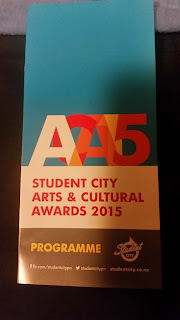 This year the Student City co-coordinator planned a massive shindig for all people and groups who had been nominated and with delicious nibbles and drinks there was a huge turn out! fact they had a printed program! 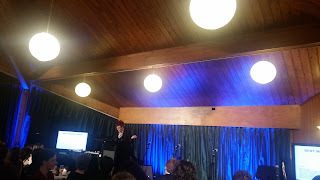 The host for the evening was Radio Control, breakfast show host Abi. Had everyone splitting their seams making the event entertaining alongside some local performances. The Fire Club was awarded with highly commended for our contributions to the culture of Palmerston North and even made it into the local NEWSPAPER. 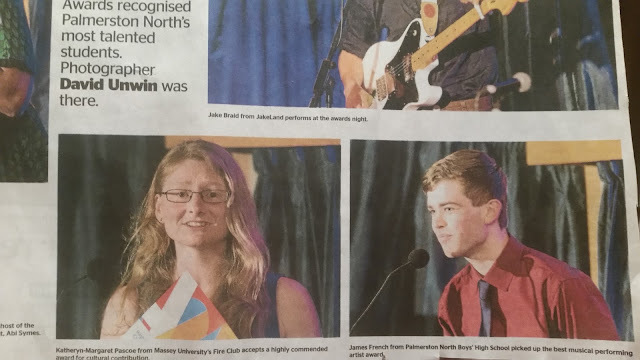 See that slightly crazy looking woman with glasses who looks like she had her hair style designed by wind and rain (the all natural look they call it) well that is one of the committee members that went up to accept the award, and roped our president into saying a speech! Who has a laminator? I think this is a keeper! Fantastic evening had all round and a huge congratulations to all of our members! A club is nothing without the members and the energy, skills, enthusiasm and passion you bring to the table. Bring on some more fun events! Coming up we have the IPC Spring Festival, Wanganui Festival of Cultures, Marton Market day and a small scale Carnival! I will also note, we have held our AGM and have an almost brand new committee! So this will be my last post as I hand over the torch to our new Secretary who will take on this role later in the month! What is the most important thing in the world? It is the people, the people, the people.